(7) What do you mean by the term ‘Assimilated Technique’ to cure such ailments.Please elaborate? In other places, you have also termed it as a ‘unique programme’. Does it mean taking all the credit for it by yourself only? Various healing techniques have been combined in this system. But the basic plan is Acupuncture. 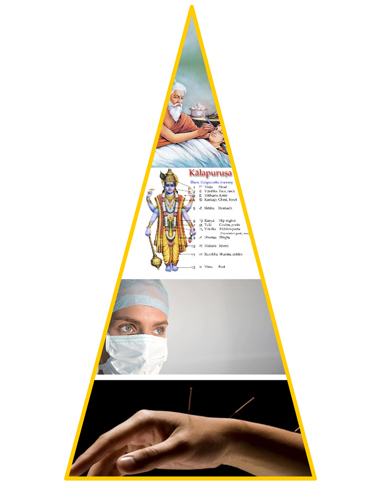 We have harmoniously combined Acupuncture, Traditional Indian knowledge, Vedic knowledge which also includes Vedic Astrology, Nutritional aspects based on constitution of patient and the most important is the understanding of the regeneration of lost tissue in the traditional system. Due to this reason it is necessary to treat one patient at a time and it takes about 3 hours every day. It is a committed treatment. Precautions have been taken while combining all these systems, so they work in synergy. I observed the application of these techniques for a long time and have slowly learnt how to combine them. Though these additions have helped a lot, in the beginning it took me 6 months to a year to gain useful vision. Now it takes me 12 days and the results are better in all aspects of vision loss. There is no question of taking credit. In fact if you go through the home page of the website, it is very clear that whatever is achieved here is due to our senior practitioners in this field. I feel that in the field of medicine, there should be no question of taking credit and recognition will come spontaneously. There should also be no patents if we want this field to develop to highest standards.